Some messages settle into our souls like a salve, providing healing where our deepest hurts and fears reside. Others remind us, through the fiercest storms, that we can be secured by a hope that won’t disappoint. Let Listener Favorites, Volume 4: Our Best for His Highest help soothe your soul and tether your heart to God’s grace. 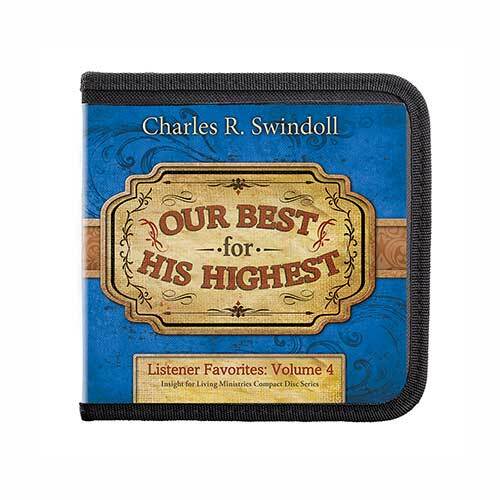 Featuring some of Chuck Swindoll’s most-requested teaching on some of the toughest issues, this six-message series covers challenges like dealing with unrepentant people and enduring suffering, sickness, and sin. When you’re tempted to worry or despair, Listener Favorites, Volume 4 will encourage you to cling to God’s grace . . . a hope that never disappoints. See the complete list of Listener Favorites resources. Copyright © 2013, 2015, 2017 ℗ 2017 by Charles R. Swindoll, Inc. All rights are reserved worldwide.